Billy Graham lived his life loving God and loving people. Even in death, the evangelist’s words are touching people’s souls and pointing them to Christ through his ongoing ministry. On Feb. 22, a day after Mr. Graham passed into heaven, Tom*, like thousands of others, visited Billy Graham’s memorial page. As he read through the “Steps to Peace with God” section, which explains how to have a personal relationship with Christ, Tom prayed to commit his life to Him. Thousands have left messages to honour Mr. Graham on the memorial website, as well as BillyGraham.org. The funeral motorcade for Billy Graham departed from the Billy Graham Training Center at The Cove in Asheville, North Carolina, and made its way to the Billy Graham Library in his hometown of Charlotte, North Carolina. 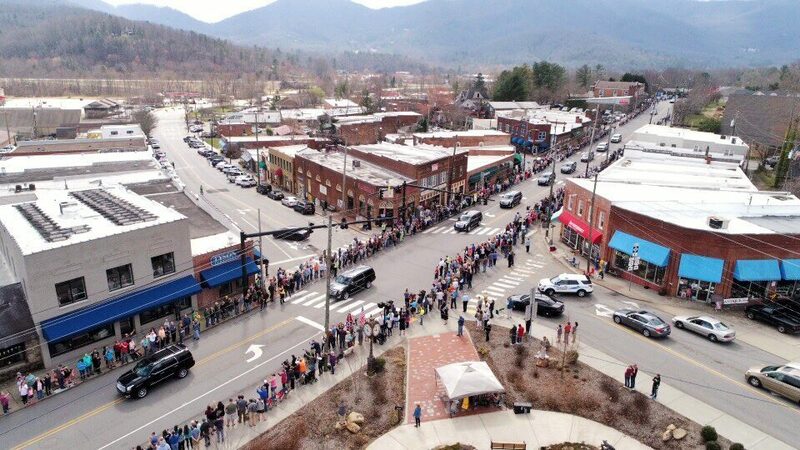 This is an aerial view of the motorcade passing through Black Mountain where Billy and Ruth Graham used to frequent a local pharmacy that’s now the Town Hall & General Store. Thousands paid their respects along the 130-mile journey. Eighteen-year-old Sara* was also moved by a Billy Graham sermon she watched online. It helped her understand the missing component in her faith. She had questions about what it means to be a Christian when she found BGEA’s online internet evangelism website, PeaceWithGod.net. There, she connected with a trained online chat coach, Gena. “How am I assured that I will go heaven or hell?” Sara asked. She told Gena she was living for God but sometimes messed up. “I feel like I have done something wrong and God is not within me,” she wrote, explaining that she attends church but doesn’t pray or read the Bible on her own. As she continued sharing, Gena helped her understand that going to church and believing in God doesn’t make someone a Christian. Gena explained that you have to repent of your sins and ask Jesus to be your Lord and Savior. During a break in their conversation, Sara watched part of a Billy Graham sermon and finally understood the missing piece—a commitment to follow Christ. She decided to pray and ask God to forgive her sins and invited Jesus into her heart. “Praise God, you are Jesus’ child … you are saved!” Gena replied. “You will go to heaven when you die,” she wrote. Gena encouraged Sara to pray every day, not just in church. “Just talk with God, like we are talking each day,” she said, encouraging Sara to ask God’s Holy Spirit for power to live in a way that’s pleasing to God. Gena also recommended Sara read her Bible regularly to stay in a close relationship with the Lord. Yearning for more from life? Find lasting hope today. Want to help searching hearts find Christ? Our world is online and we want to meet people there with the Gospel. Through Search for Jesus, BGEA’s Internet Evangelism ministry, you can help reach people around the world in their moment of need—no matter who they are or where they might be. Every day, people of all ages and backgrounds read online about God’s love for them and have a chance to respond to the Gospel. We’re connecting with them one on one to point them to Christ and disciple them in their faith.